Make your surroundings more lively with this LED Lamp. Visitors will be amazed at the illusion that the lamp creates! This lamp is bound to light up not only your room, but also your lives giving you good vibes. Get yours today! The LED Illusion Lamp is a combination of art and technology, it creates an optical 3D illusion but plays tricks on the eyes. Actually, the 3D effect seems real and amazing, but as you get closer, you will see a thin acrylic glass sheet that's completely flat. It's bound to dazzle and impress your guests while always lighting up the room and your lives, especially at night. The acrylic plate must be PUSHED into the base not just sat on it. Press the touch screen button to choose the color. Color changes in order when you touch the sensitive button: Red - Green - Blue - Yellow - Cyan - Purple - White - All Color Flashing In Turn automatically. Note: Since the size and weight above is measured by hand, the size and the weight of the actual item you received could be slightly different from the size and weight above. Meanwhile, please note that due to lighting effects, monitor's brightness/contrast settings et., it's normal that the light effect has a little different from the image. 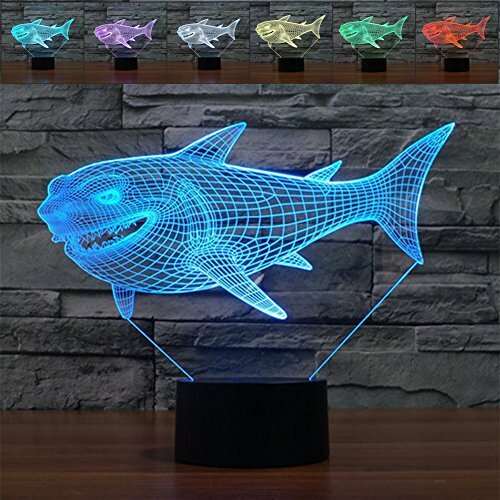 ✔Optical Illusions Lamp: 3D visual shark creative lamp is an innovative artistic atmosphere light, Optical acrylic light guide plate engrave a variety of 2D graphics. Unique lighting effects amazing 3D visual effect.It makes your home more interesting. ✔Best Night Light: The lamp not only has 7 different colors,but also has a flash mood. Fixed it, if you need.The light is very soft,not dazzling.Ideal for nightlight for your kids.It can regulate the atmosphere in your room. Choose the light according your mood. ✔Easy to Use: Contect the lamp to power through USB cable.Go ahead to adjust the night light color. Smart Touch control 7 colours change - red, green, blue, yellow, cyan, purple, white.When the second white, wait a moment, 7 colors automatic changing. ✔Safety & Save Energy: The shark lamp plate is made of PMMA acrylic, strong, high toughness, not fragile, will not hurt the child.No matter how long to use, the lamp will not get hot.Safe to touch. Shark Lamp support USB powered.Energy efficient lifespan of 10,000 hours LED bulbs. ✔Guarantee - A must have for home decor - YKL WORLD offer 12 months exchangeable or full refund.100% risk-free satisfaction guarantee to let you buy with confidence. If you have any questions about this product by YKL WORLD, contact us by completing and submitting the form below. If you are looking for a specif part number, please include it with your message.